By TruePublica: In the last year, the biggest and wealthiest tech companies, corporations and individuals continue with absolute contempt for the rule of law using criminal business and accounting practices in the search for extreme profit and tax evasion. In the meantime, the news is censored that thousands of the poor and vulnerable were arrested, prosecuted and sent to over-crowded jails for stealing food. Yesterday, Google was hit with a fine from the EU of €4.3 billion for breaking anti-trust laws and abusing its market dominance. It comes just over a year after the Commission slapped a landmark €2.4-billion ($2.8 billion) penalty on Google, a unit of Alphabet Inc, for massively distorting its shopping service over those of its competitors. Google made £110 billion last year. Last week it was widely reported that Facebook is to be fined a pitiful £500,000 (18 minutes of profit or the equivalent of a cup of coffee for an average salaried UK worker), for its part in the Cambridge Analytica scandal. FB made $41 billion last year. The month before Apple was caught out (again) where an Australian court fined it millions for misleading customers and refusing to fix its products that had been serviced. The fine is nothing when compared to the amount of taxes Apple is paying for its business activities across the entire European Union – reported just last week to be just 0.7 per cent. Apple made $230 billion last year. A couple of months before that the US Environmental Protection Agency (EPA) announced its fine to Amazon for $1.2 million for allowing illegal pesticides to be sold on its platform. Again, like Apple, it wasn’t paying its taxes in the EU and was ordered to pay €250 million. This is a drop in a very big bucket for Amazon given that its boss is the wealthiest individual in the history of mankind with $142billion to his name. Perhaps one should not forget Amazon’s appalling and well-documented labour conditions and unjust treatment of workers and for putting local small and mid-sized stores out of business, whilst he funds an ego project to land on Mars. Amazon made $178 billion last year. In fact, all these companies, that represent the biggest have faced non-stop fines throughout the years and it only seems to get worse the wealthier they get. But of course, it doesn’t stop there. In this same twelve month period, Uber has faced criminal probes including various tax scandals. Credit rating firm Equifax makes its profits from selling personal, often sensitive information to financial institutions and lenders. It was at the centre of one of the worst data breaches in history, with the information of some 145 million people. It’s also being investigated for insider trading whilst bracing itself for multi-billion dollar fines. America’s General Electric got ‘done’ for being the top corporate US tax evader and Volkswagen’s truly scandalous involvement for their multiple roles in the emissions-cheating scandal that has now widened out to many other car manufacturers. Somehow, they all felt that competition was best dealt with by lying, whilst thousands die of lung-related diseases. In fact, it is estimated that 38,000 will die each year because of diesel emissions. More fines were dished out amounting to billions. The world’s biggest businesses, heads of state and global figures in politics, entertainment and sport who sheltered their wealth in secretive tax havens were revealed in yet another tax haven scandal last November, this time called the Paradise Papers. This was about – shhh – don’t say it – Britain’s offshore empires. This is a prime example of life today. Our state and political leaders, corporate and religious leaders are demonstrating their disdain for the rule of law and criminally evade due taxes that austerity deprives everyone else of. These people are supposed to be setting an example to the rest of society. To name but a few involved in these crimes feels like treason; the Queen, where some of her illegally stashed cash was invested in a retailer accused of exploiting poor families and vulnerable people. A previously unknown $450m offshore trust that has sheltered the wealth of Lord Ashcroft – remember him. He’s was the Tory peer and major donor accused of being a tax exile with dodgy non-dom status and accused Britain’s PM of ‘abusing’ a dead pig at Eton. Private jets, luxury yachts and billions paid out in falsified tax refunds – by dishonest facilitators such as accountants and bankers walking freely in the streets of London in sharp tailor-made pinstripes. They also launder dirty money whilst they are at it for the very worst people alive including despots and dictators, human traffickers, drug barons, gun runners and many more. The corporations and wealthy are now accused of shifting $600 billion a year – more than the individual GDP of 85 per cent of all the countries in the world. Let that sink in for a moment. It takes 3 weeks to count to a million but 31 years to count to a billion. And yet, a hungry couple ended up in court after raiding a locked Tesco compound for out-of-date food destined for the rubbish as they only had £8 a week to live on. Or, how about this, 26-year-old Macirj Jakub Swierdza , from Dartford in Kent, was jailed for 30 days, fined £150 plus £15 compensation and a further £80 amount for “ Victim Support “ after stealing a bar of chocolate. In 2015, a single investigation in the UK found that 12,400 people had been caught stealing food. Many were jailed. 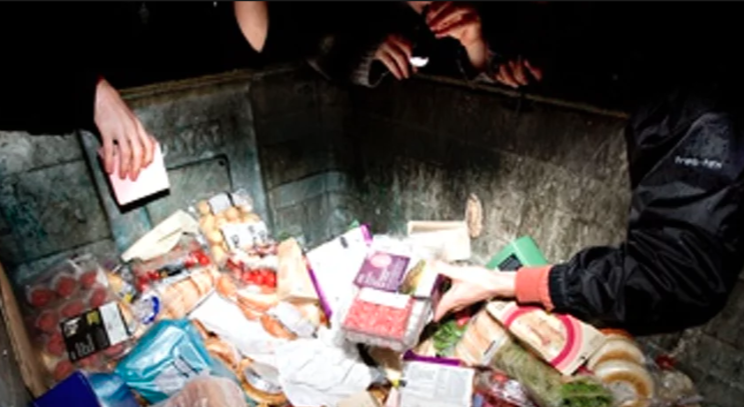 The average value of food stolen, often from the bins of supermarket yards was £15 with a typical jail term of two weeks and a £150 fine. The news didn’t go down well with anyone, especially government. The following year the same investigator at the London Economic attempted another investigation into food thefts across the country and were denied Freedom of Information responses by government departments. The same happened again in 2017. There’s a loophole in the FoI laws that allows government departments to refuse information and it is being used in this case. And yet, if you search on the internet, the only stories you find about food thefts by the hungry are from around 2015 and further back. Which brings us on to that all important question. Why are the poor being arrested for the minor crime of attempting to not starve – when the rich and powerful blissfully carry on filling their boots with their ill-gotten gains. For instance, HMRC, employs around 500 staff (as at March 2017 – according to FullFact) out of 26,000 staff to ‘work with taxpayers with assets over £10m’ (their words not mine). HMRC say their efforts netted the taxpayer £2 billion. In the meantime, according to another state department the DWP, their annual 2017 report into benefit fraud and payment errors by the department stated that 22 million people were administered welfare in the year. Of the total amount dished out by the department (about £175billion), £3.5 billion of it or two per cent was given out in overpayments. Of that, about £2bn was fraud. £2 billion in benefit fraud, £120 billion ‘tax gap’ as HMRC like to call it. You can see the disparity can’t you – and there’s only one conclusion you get to. There are two sets of laws.